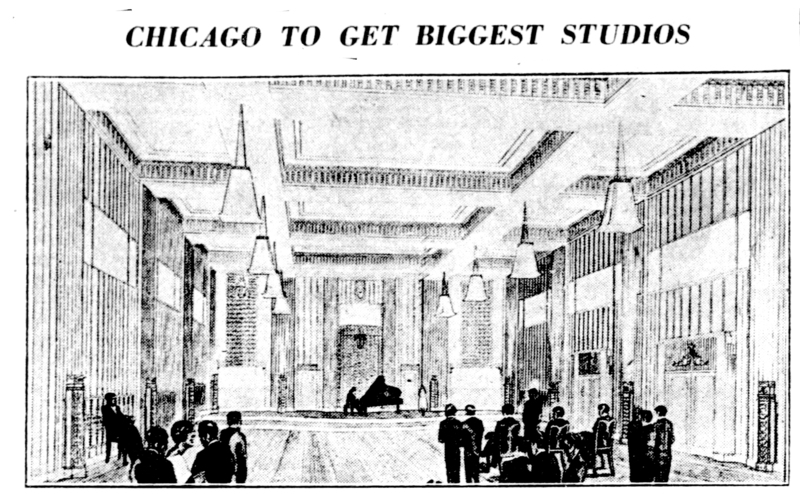 Plans for radio studios called “the world’s most pretentious” were announced yesterday by M. H. Aylesworth, president of the National Broadcasting Company, to be situated on the roof of the Merchandise Mart in the heart of Chicago. Formal opening of the new quarters, tentatively planned for Jan. 1, 1930, will be a definitive step in fulfillment of Mr. Aylesworth’s prediction two years ago that Chicago is destined to become one of the great broadcasting centres of the country. The fact that the Chicago headquarters of the National Broadcasting Company are to be more pretentious than those now in use in New York, Washington or San Francisco is regarded as a significant recognition of Chicago’s position in the broadcasting field. An increasing number of programs are being originated in Chicago studios, and pressure of the business has necessitated expansion virtually impossible in the present location in the Lake Michigan Building. It is pointed out that in the new location special construction will eliminate many of the physical and mechanical limitations of the usual office building. There will be six studios, fully equipped with the latest developments in radio apparatus. Wire lines and other facilities will be installed permitting expansion to an unlimited number of studios. Studio A will be the largest radio theatre in the world”, said . It will be 75 feet long, 51 feet wide with a 26 foot ceiling, giving a total floor space of 3,820 square feet and a total content of 99,450 cubic feet. It will provide standing room for 1,000 persons, it is estimated. The studio will have a large number of innovations in equipment. Instead of the usual velvet on monks’s cloth drapes utilized in the regulating of acoustical effects, it will be walled with adjustable narrow panels. These strips will be movable in such manner as to present refractive, neutral or absorbing surfaces to the sounds produced in the room. A great pipe organ and organ loft specially adapted for radio representations of varied character will be installed. A raised stage for use in productions permitting the presence of an immediate audience, and also useful in balancing and placing of large orchestras will occupy one of the studios. The other studios will vary in floor size and ceiling height to meet various acoustical conditions and adaptations to various sized musical aggregations. An architect’s drawing of one of the studios of the world’s most pretentious broadcasting quarters, soon to be built by the National Broadcasting company atop the world’s largest building, the new Chicago Merchandise Mart. Each studio will have its own monitoring and observation room adjacent and a soundproof glass partition will separate them. The monitor rooms will be raised above the studio level in order to give the studio engineer and production director better views of the performance. Further, each studio will have a soundproof glass enclosed balcony to enable guests to both see the performance in the studio and hear it through loud-speakers as the radio audience hears it. All studio units will be thoroughly soundproofed through the medium of floating walls and floors. The studios will be without windows (and partially hermetically sealed for soundproof), the vestibule being regulated through modern equipment maintaining a constant flow of pure air at a regular temperature and with a uniform degree of humidity. With this system temperature is automatically maintained within a variation of two degrees Fahrenheit. In the centre of the main control rom will be two main control room boards, each 30 feet long. One will be used for amplifiers and control of studio equipment. The other will carry the apparatus which controls connections with wires carrying programs to and from points outside the studios and will permit of expansion. A master control desk in this room will be the nerve centre at which the routing of all programs and can supervise the cutting of programs on and off the networks from studio to studio. Delicately adjusted time-system clocks will show the correct time to the fraction of a second, an item of major importance in regulation of programs over far-flung networks. All equipment, including power supply, will be installed in duplicate to insure uninterrupted transmission of programs. Chicago Commerce, December 7, 1929. Scarcely more than eight years ago radio as a device for furnishing entertainment in your home was practically unknown. Up to that time its use had been confined principally to government enterprise, to the safeguarding of navigation and to amateur experimental effort. Under those conditions it was perfectly natural that the radio industry, as constituted at that time, should offer but little lure for the investment of capital either in Chicago or elsewhere. But when, in the autumn of 1921, radio for home use came into being and the public responded so tremendously to what it had to offer, an entirely different picture was presented. It immediately became apparent that radio was destined to be not only one of the great industries of America, but one which would attract the best brains and the keenest capitalists in the country. From the very first, Chicago has had a dominant part in the development of the radio industry. In keeping with the “I Will” spirit of this great city, which means that Chicagoans do nothing by halves, some of the greatest radio plants in the world were founded in Chicago. Because of its central location and many other advantages, it was only fitting that Chicago take the lead as a radio center. Chicagoans as a whole seemed to become “radio-minded,” almost over night; and even in the early days of the manufacture of radio devices there appeared to be a wealth of brains and initiative available for building up radio industries in Chicago. One concern in Chicago, recognized as the largest in the world, is making every part of a radio outfit including chassis, speaker, cabinet—making radio receivers complete at the rate of 6,000 console sets per day. With other radio concerns engaged in producing materials for various other branches of the industry, there can be little to argue about as regards Chicago’s standing as a leader in the field of radio. Accurate comparative figures are difficult to obtain; but the amount of business done by radio concerns in Chicago, as compared with what is done in other cities, is far in the lead. What of the future of radio? Television, for practical use, yet a mystery, still is in the offing, to be solved commercially. Probably when a real, practical television set for the home is developed it will be developed by Chicagoans, or rather by Chicago capital. A Chicago radio manufacturer already has established foundations in many colleges for the development of new things in radio. He is creating in Chicago one of the greatest scientific laboratories ever yet approached by laboratory organizations, either in the radio industry or any other field of endeavor. Out of this progressiveness on the part of Chicago capitalists are certain to come new things in radio that perhaps some day will be as startling as was the radio principle itself, when it first burst upon a waiting world. From all of which it may be seen that Chicago, never backward in anything, has taken the lead in radio development; and unless some unlooked-for calamity arises, Chicago intends faithfully and consistently to maintain that leadership.